Tomato Spotted Wilt Virus or TSWV is one of the most important viruses for horticultural crops. It was discovered in 1915 in Australia. But back then we didn’t know what a virus was. TSWV is a single strained RNA virus. The virus is actually a genus of viruses called tospoviruses. There are more than twenty different viruses part of this genus which cause the disease. Different viruses of this genus have different vectors. Vectors move a pathogen from one host to another. In the case of TSWV, the vector is thrips. How can we control thrips to prevent the virus from causing significant economic damage? Thrips are small insects that are common greenhouse pests. They are closely related to aphids and lice. 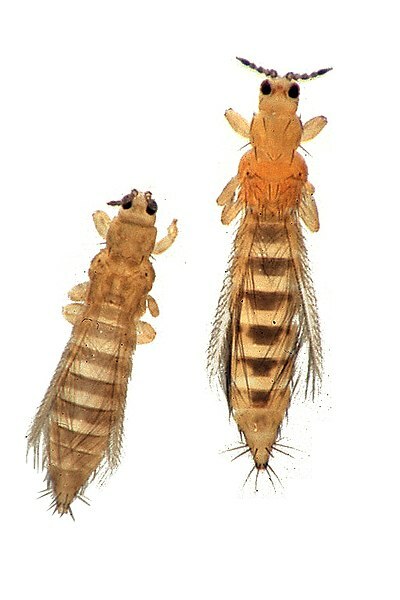 There are several species of thrips that affect agriculture. Different viral species are associated with thrips species. Tomato Spotted Wilt Virus would spread very slowly in the absents of thrips. Because of this, control methods today focus on killing thrips and preventing them from spreading the disease. But thrips are hard to kill. There is a reason why thrips make great pests they can multiply quickly, live in hard to reach places, and can easily become resistant to pesticides. Just a few thrips can recover a population. New thrips can easily be introduced from weeds near crops. What makes thrips a great pest is where they hang out. Thrips spend time in flowers which makes them hard to kill with pesticides. Later in their life, they then retreat to the soil, another protected place from pesticides. Both environments are hard for pesticides or natural predators to reach. Trips population can grow exponentially in the right conditions. When exposed to pesticides some of the population will be naturally resistant this resistances would be passed down to the next generation. These three factors multiply quickly, live in hard to reach places, and can easily become resistant to pesticides make thrips a great pest. How do thrips infect plants? Thrips acquire Tomato Spotted Wilt Virus when juvenile, but cannot infect plants. Only adults can infect new plants. This fact might be a key to fighting the diseases. Photo by: Alton N. Sparks, Jr.
To fight thrips we must reverse why they are great pests and how they infect plants. This means making thrips: live in easy to reach places, multiply slowly, hard for them to resist pesticides and/or prevent them from infecting new plants. Let’s look at the first one, making them easy to reach. Making thrips an easier target would require them to move to another location or changing their habitat. Thrips could be tricked into moving by an aggregation hormone. If a stink bug has ever been in your home you might notice that there is often more than one. If one stink bug finds a warm cozy place they release a hormone to let other bugs know where a safe place is. Insects use aggregation hormones to communicate nice places to live. Some thrips have been observed to be attracted by chemicals similar to aggregation hormones. One chemical Methyl anthranilate was shown to attract two thrips species: Thrips hawaiiensis and Thrips coloratus (T. Murai, T. Imai, and M.Maekawa. 2000). Similar chemicals could attract other thrips species. We could use these attractants to introduce agents to control the thrips population. Now that we can apply chemicals to them what should we do? The reason why insects become more resistant to insecticides is evolution. The susceptible individuals in the population are killed unable to pass down their genes to the next generation. The mutant individuals, some may have a resistance to the insecticides have a better chance at survival and they pass these genes to the next generation. Insects can reproduce quickly and before long there is a generation where most of the individuals are resistant to the insecticide. How can we prevent this? To prevent resistance the susceptible portion of the population must be allowed to reproduce and pass their genes on. Some of the pesticides used are actually insect hormones. One group of hormones is Juvenile hormone. Pesticides that are hormones interfere with the normal insect lifecycle. At high doses, they kill the insect. At a lower dose, they would just alter the lifecycle of the insect. After attracting the thrips to an accessible location Juvenile Hormone could be applied to delay the mating. Two compounds that mimic juvenile hormones are pyriproxyfen and methoprene (Youhei Suzuki, Kenjiro Furuta, et al. 2015). Molting hormone like Ecdysone, which is an insecticide, at low doses could prematurely cause juvenile thrips to become adults. Altering the lifecycle of thrips would reduce the amount of offspring, and cause them to multiply slowly. Because the insecticides are not used and a chemical is not killing thrips the pressure to adapt and become resistant is lower. Using hormones to disrupt the lifecycle is better for a long term strategy than traditional pesticides. Combining these two methods. Methyl anthranilate could be used to attract thrips. Once the baby insects are attracted compounds that mimic the insect’s hormones would be used to alter the lifecycle and reduce the number of offspring. Instead of controlling the pests another solution is to alter the pest. We could use genetic engineering to alter thrips. If thrips did not transmit plant viruses and Tomato Spotted Wilt Virus then they would not be as big of a problem. The genetics of thrips can be altered. The virus once is introduced into the thrips body can be transmitted the rest of the life of the adult thrips. The mouth pieces of thrips can be changed so that juvenile thrips do not acquire viruses or so that once they are acquired adult thrips cannot transmit them. These genes would drift into the wild thrips population. The systems I propose is quite complex. So far I have proposed using chemicals to attract insects then alter their lifecycle. Or using genetic engineering to prevent the vector from transmitting plant viruses. Both of these methods would take time to develop and would cost money all to allow us to produce crops in greenhouses in the same way we have been doing. More and more I have realized the importance that the environment plays in the spread of disease (The Importance of the Environment). Most of the time we are not dealing with a new pathogen, instead it is a pathogenic agent we already know. Instead of focusing on the pathogen we should focus on changing the environment so that it is harder for a disease to spread. For a long-term solution for TSWV we need to change the environment. What is the environment in most greenhouses? Plants are close together. The tight spacing increases the production of the crop but makes it easier for insects. Spacing is made worst with few plant species.The greenhouse is a monoculture. One or few plant species will make up large sections of a greenhouse and make it easy for a single insect to multiply and cause problems. Greenhouses have few insects in them. When insects in commercial greenhouses are spotted they are killed by applying commercial insecticides to the whole greenhouse. A solution is not always the best solution. Another solution to pests and plant viruses is changing the environment of the greenhouse. Greenhouses in the future should be a polyculture, growing many different plants mixed together. Beneficial insects can keep thrips in check. A whole ecosystem could be created all to keep thrips and other pests from causing damage. Growing in these greenhouses of the future is the cheapest and best long-term way to keep thrips in check and prevent plant viruses like Tomato Spotted Wilt Virus from spreading.